I am sitting on the balcony of an apartment looking down one of the narrow streets of Plaka, in the old heart of the city, looking up at the Acropolis, lit by last light. Inside, The Traditional has fine furniture made by the owner’s father, including a rocking chair and dresser full of Greek crockery. His mother’s paintings of ocean scenes hang on the walls. The lounge room has books and personal ornaments, embroidered table runners and a fully fitted kitchen. The owner has left all sorts of snacks and supplies, and a bottle of wine. The whole room is charming. There is a main bedroom with full-length doors, and a whole wall of built-in cupboards, and a second, single bedroom, with a full glass door to a balcony, too. The bathroom is clean and has a bath and washing machine. I booked The Traditional apartment, in what I think is the best spot to stay in Athens, for €80 ($125) a night. I really feel I’m living like a local. And that is the point — not to be spending hundreds of dollar a night, and not to be hermetically sealed in a fancy hotel; to not be isolated from Athens but to feel part of it. From the balcony, I can hear others chatting in Greek on theirs. A couple walk down the road arguing. Kids coming by chattering, eating gelato. But when I am inside, with the doors shut, The Traditional is quiet and I get the best sleep that I have had in ages. The Traditional is at 17 Dedalou, Plaka, Athens. Search online or call helpful Stelios on +30 698 586 5433. A five-minute walk from The Traditional in Plaka, the Phaedra Hotel is simple and inexpensive. 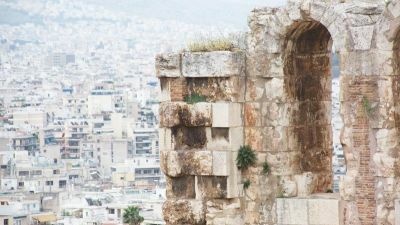 The view of the Acropolis and over Plaka from its rooftop is spectacular. I booked a double room with a small balcony for €95.50 a night. It’s a warm afternoon and, rather than using the air-conditioner, I open a door to the balcony, and then open the windows and find the whole casement is hinged and I can throw it all wide. Plaka, Athens, Greece, its history and its contemporary life is spread before me and it pours in the window. Below, on the corner, potential passengers barter with taxi drivers in Greek. Down in reception, I ask the helpful ladies where might be good for dinner. They write down the restaurants they go to. “Efchari’sto,” I thank them in Greek. “Efchari’sto,” they reply that I’m welcome. And I do feel welcome in authentic Athens. Athens is full of gift, souvenir and clothing shops but what’s interesting is that so many are full of Greek products. Shopkeepers proudly announce this when you enter. “Not made in China or Thailand,” as one shopkeeper confirms. What’s also interesting is the standard of design — clever and often inexpensive jewellery, clothing and leatherwork. There are little designer shops full of quirky, well-made items. There are carved olive-wood kitchen utensils; Greek wine; traditional Greek slippers with pompoms on the toes for €8. But the classic gift is glass “eyes” usually in concentric blue and white circles, to ward off the “evil eye”. It is believed that those who envy or dislike you can give you the evil eye. It is believed by many cultures but started in classical Greece. “Evil eye” motifs are believed to absorb evil until they’re full. One Greek tells me they will crack then. “It is proven!” Then you just get another. Greek salad (truly tasty tomatoes, olives, cucumber, onion and fetta). Stuffed vine leaves, tzatziki, fava from yellow split peas, hummus and wholesome bread. Taverna Platanos. Next to the musical instrument museum in Diodenous Place, Plaka, since 1932. Authentic and best for lunch. Have a stuffed tomato and tzatziki for me. Saita, in Kidathineon 21, Plaka. Authentic. Sit outside and watch street life. Better still, go down the stairs to the old taverna, with wine in big timber barrels. Eggplant and fetta from the oven. Brilliant. Museum of Greek Folk Musical Instruments, Diogenous Place, Plaka, Athens. Bouzouki and baglamas, flutes made from the wing bones of birds of prey. Ouzo glasses and spoons used as instruments. There’s audio and film of the instruments being played, and it’s free. Museum of the City of Athens. 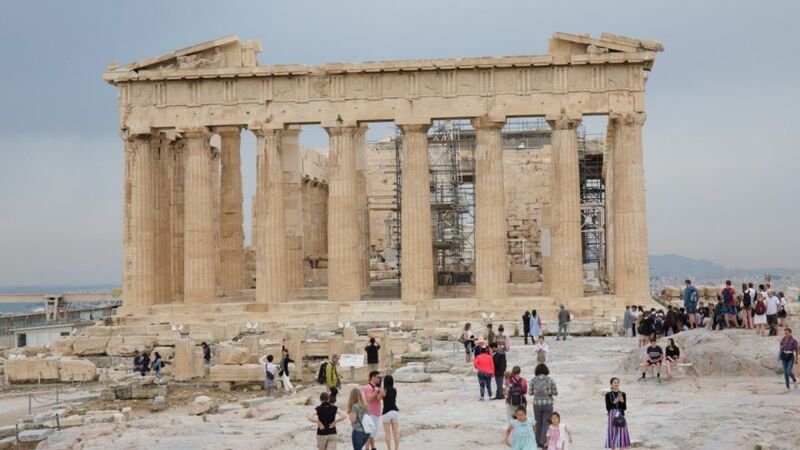 Explains the history of the Acropolis rock, from political to spiritual, and the growth of the city underneath its ramparts. In an old mansion. Museum of the History of the Greek Costume of the Lyceum Club of Greek Women, Athens. 7 Demokritou Street, Athens. It was full of invasions, alliances and liaisons. And Crete was in the middle of it all.